2019 Festival Poster - Louisiana Pirate Festival in Lake Charles! Gumbeaux Gator, Jean Lafitte Karl Lopez, Stacy Bearden and Mayor Nic Hunter of Lake Charles unveil the commemorative 2019 Louisiana Pirate Festival poster at the press conference held on April 16, 2019. To purchase a signed and numbered poster, call the Louisiana Pirate Festival office at (337) 436-5508. 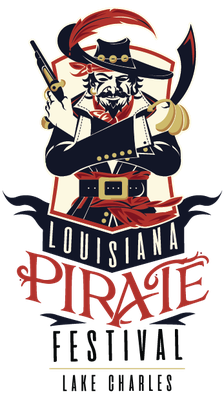 The 2019 Louisiana Pirate Festival Poster was created by Stacy Bearden of Sulphur. The poster was unveiled at the Louisiana Pirate Festival news conference held on Tuesday, April 16, at the Lake Charles/Southwest Louisiana Convention & Visitors Bureau. "The poster design I had in mind was influenced by movies I watched as a child. The image of a pirate swinging into action onto a ship in the middle of the night has stayed in my mind. Peter Pan and Captain Hook, The Pirate Movie in the early 1980s, and later movies such as Pirates of the Caribbean have all been favorites of mine. For a little boy watching those movies, it was an exciting time in history that paralleled the wild west. It was like a different version of cowboys, bandits, and bank robbers,” said Bearden. Bearden, a self-trained artist, has been creating special, custom art since 2015. Bearden’s art subjects include fine art and pet portraits, wildlife, Christian art, and comic book character art. Last year his first children’s book, in which he wrote and illustrated, Boudreaux and the Louisiana Mosquiteaux, was published. He has hosted several art exhibits in the area, as well as participated in Works of Men at the Henning Cultural Center Art Gallery in Sulphur and Chaos Theory, an art exhibit that honored local pop culture artists. Bearden’s art can be seen on display at various family businesses and on his website and social media. Bearden is the owner of Bearden’s Music in Sulphur where he uses his 28 years of experience to teach piano lessons. Stacy and Amy Bearden have been married for over 20 years and have 2 children, Ethan and Madeline. To purchase a signed and numbered poster, call the Louisiana Pirate Festival office at (337) 436-5508.